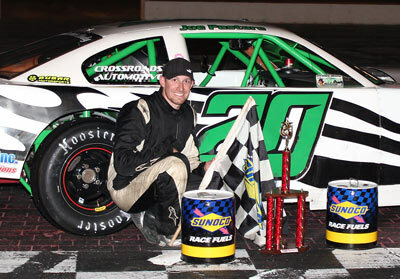 The glory days returned to Oxford Plains Speedway this past weekend as the track returned to Saturday night racing after trying Friday nights for the past couple of seasons. Winners on Whited RV night included Shawn Martin, Spencer Morse, Guy Childs Sr. Joe Pastore and Shawn Hinkley. Point leader Shawn Martin survived all challenges, and took advantage of other driver�s bad luck to lay claim to the Budweiser Pro Late Model checkered flag. Race long leader Mark Lundblad Jr., and TJ Brackett tangled sending Brackett to the rear, and Lundblad to the pits hooked to a wrecker. Martin inherited the lead with four laps to go and held off Joe Pastore, whom started dead last in the 24th position for the win. Following the lead pair were Tim Brackett, Scott Moore and Kyle Treadwell. Sixth through tenth positions included Jeremy Davis, Alan Wilson, Gary Norris, Tommy Ricker, and Scott McDaniel. Heat checkers flew for Lundblad, Donnie Wentworth and Billy Childs Jr.
Joe Pastore dusted the P.A.S.S. Sportsman field, as Sam Gooden, Dan McKeage, Rusty Poland and Scott Dorr followed him to the stripe. Pastore also captured the preliminary round. Point leader Spencer Morse padded his lead by winning the Allen�s Coffee Flavored Brandy Street Stock 30 lap main event as he raced by leader Kyle Hewins on the fourth turn of the very last lap to secure the victory. Hewins finished second ahead of Ryan Hewins, Keith Stuart and Richard Spaulding. Stuart and BJ Chapman won their respective qualifiers. Guy Childs Sr. scored an impressive victory over multi-time feature winner and point leader, Troy Jordan in the Ripley and Fletcher Ford Outlaw Sportsman feature event. Michael Haynes, Steve Moon and Bryce Mains completed the top five. Jordan picked up the heat win. The Banditos division continues to grow as eighteen cars rolled into the pit area to take part in their 20 lap main event. Shawn Hinkley took no prisoners as he jumped out front and never looked back. Newcomer John Childs finished second ahead of Dan Wade, James Record and Cam Childs. Racing action resumes this coming Saturday night as Pepsi sponsors the night�s activities. All kids are encouraged to bake a cake for their favorite driver to present to them at intermission. There will be a full card of Oxford Championship Series racing, plus the PASS Mods will be in town. Post time is 7pm. Adults are just $12, Sr. and Military Personnel are just $10, and Jr. tickets are $5. Kids 5 and under are free.